Poor air quality affects us all, but is especially harmful to seniors, children and those with respiratory illnesses who are the most vulnerable. It’s important for San Diego residents and businesses to recognize this situation and work to lessen local air pollution, which is mainly a byproduct of vehicle transportation. You can be part of the air pollution solution on Wednesday, October 3, when San Diego celebrates California Clean Air Day at Fair@44 in City Heights. The event will address the need for improved air quality in the region and describe the various actions community members can take to help. A press conference featuring local elected officials will precede the community event starting at 4:00 p.m.
For example, the Metropolitan Transit System (MTS) has acquired electric buses as part of a trial program. Electric vehicles (EVs) do not release smog-forming emissions, so these buses will not pollute our air. They will improve San Diego’s public health and help meet the goals of local climate action plans. Last month, MTS also introduced its South Bay Rapid service, a nonstop commuting option to downtown that provides more residents the opportunity to take a quick bus trip instead of getting behind the wheel and searching for parking. Every effort to reduce polluting car trips leads to cleaner air. “Improving mobility options, including public transportation, is an opportunity to improve the health of San Diegans and our quality of life. Transit builds communities and connects us together,” said MTS Board Chair and San Diego Councilmember, Georgette Gómez. There also are incentives for purchasing EVs and chargers in the region. The state’s Clean Vehicle Rebate Project offers Rebate Now, a pilot program limited to San Diego County residents that gives residents the opportunity to be preapproved for an EV rebate prior to purchasing or leasing an eligible vehicle. For charging your EV, San Diego Gas & Electric’s Power Your Drive program provides low-cost charging stations for multi-unit dwellings (e.g., apartments and condominiums) and workplaces. For sites located in a disadvantaged community, an applicant maybe be eligible for an EV charger at no cost for installation or maintenance. 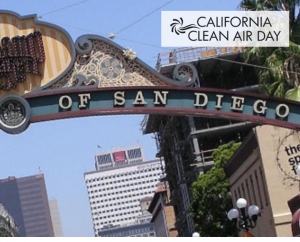 SDG&E also offers a time-of-use electricity rate so that customers can charge during the cheapest times of service—like midnight to 6 a.m.
San Diego California Clean Air Day event organizers deserve special recognition for uniting people to improve our community health. Thanks go to San Diego Councilmembers Georgette Gómez and Chris Ward, Assemblymembers Todd Gloria and Lorena Gonzalez Fletcher, San Diego Gas & Electric, Center for Sustainable Energy, The Greenlining Institute and Coalition for Clean Air.